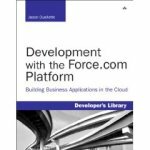 Jason Ouellette, Appirio Chief Architect and author of Development with the Force.com Platform: Building Business Applications in the Cloud, will be conducting a developer webcast on development for the Force.com platform. The webcast will be next Thursday (August 19, 2010) @ 10 a.m. PDT / 1 p.m. EDT. Jason architected our PS Enterprise product which is reported to have 40,000-50,000 lines of Apex code. He definitely know how to develop application for the Force.com platform. Jason has held numerous senior engineering and architecture positions at companies such as Composite Software, Informance and webMethods. At webMethods, Jason was the third employee and invented numerous technologies that made the company the leading provider of B2B infrastructure. He helped architect the industry's first XML-based B2B server, then invented and led the development of the first B2B application for securely managing the exchange and processing of most common business document formats, such as XML and EDI, among trading partners over the Internet.